Manually hooking up your trailer to your tow vehicle can be quite the awful experience. I mean, it takes its toll on your body after a while and can cause severe issues in both your back as well as your arms. These issues becoming a significant problem is why manufacturers saw it fit to create devices called electric tongue jacks. But the only problem with these products is they’re incredibly popular, and the massive amount of options a customer has to choose from is somewhat frustrating. In fact, it makes finding the best electric tongue jack mind-numbingly difficult. Given this information, I thought creating a buying guide about these products could be beneficial for other consumers and save you from the nightmare I experienced. 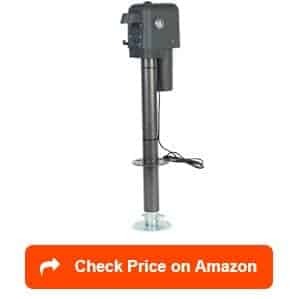 This buying guide will cover all the relevant topics about electric tongue jacks and point you in the direction of some high-quality products that I have deemed the best on the market. All of this information will hopefully ensure you don’t have to spend much time searching for the perfect jack. So please, keep reading and let me help you make this experience as painless as possible by breaking this marketplace down into something more manageable. This section will provide you with product reviews discussing seven electric tongue jacks that we consider the best on the market. We’ll also review three top-notch manual tongue jacks as well to give some idea of the differences between the two products. And from these discussions, we hope you start to understand what the best electric trailer jack might look like for your circumstances. Our first product is the Quick Products JQ-3500W Electric Tongue Jack, which could make numerous RV owners happy with its set of beneficial features. For instance, I love its rather extensive 3,650-pound loading capacity. This feature could handle lifting my 6,000-pound trailer with relative ease. I also enjoy that this product comes with the standard tongue jack dimensions, which makes installing this model incredibly simple: even a mechanically challenged person like myself could do it without outside help. The manual crack override is another feature, which could lend itself handy. 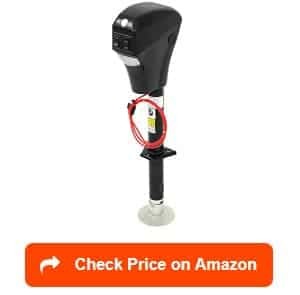 You see if the battery dies this feature could act as a back-up plan and give an alternative way of lifting your jack without providing further complications. It also helps that the manual crank connects right on the top of the jack and seems to operate without requiring much effort from you. The fact this model has water-resistant electrical components is another aspect you can take comfort in as a potential consumer. The heavy-duty weatherproof vinyl cover helps in this regard as well. This feature will adequately protect the jack from any environmental factors that might harm it such as corrosion or water damage. I should also mention that this model’s bubble-style leveling cap is another delightful feature for a potential buyer. You see its inclusion makes sure you won’t have any issues ensuring your rig is perfectly level every time you intend on hooking it onto your tow vehicle. Plus, all these wonderful features come at a fantastic price. But sadly, not everything about this product ends up being entirely user-friendly. Several customers complained about the operation being rather slow compared to other models they’ve tried in the past. An issue like this one isn’t something I like seeing in the customer reviews of a product I’m seriously considering. I doubt you do either. The Lippert 285318 3500LB Power Tongue Jack is another model that would be perfect for my particular circumstances. It has a 3,500-pound loading capacity, which would be more than enough for my 6,000-pound rig. I also like that this model comes with a textured casing, which will help protect it from falling victim to cracks or chips. Nothing worse than buying a product than dropping it one time and you see that it has a nasty crack within its structure. With this product, this issue will thankfully not be a problem. It coming with all necessary mounting hardware is not a bad feature either: it makes the installation process much more manageable and ensures you don’t have to buy anything separately. You should feel a sense comfort with the inclusion of the manual crank override as well. This feature will also ensure you have a way to jack your rig regardless of whether or not the battery is dead. And if the battery isn’t dead, the using process for this model is extremely convenient as you can achieve perfect leveling with a push of a single button. In other words, there’s nothing complicated about this device, which is always a win for any product I’m considering. Along the same lines, this model comes with four LED lights, which means using this jack in the dark isn’t a complicated issue like it might be for some others. All in all, this Lippert product is a solid, unspectacular option that’ll get the job done. However, this product being a solid choice doesn’t mean it’s flawless. You see there are two rather concerning issues I have with this particular jack regarding its slow operating speed and its poor durability. 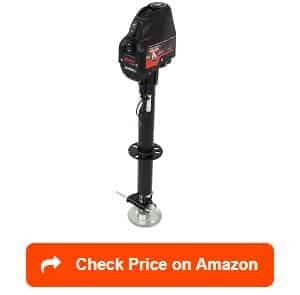 If you’re looking for a product with the least amount of electric tongue jack maintenance, the Big Horn 3500 LBS Electric Trailer Tongue Jack could be a decent option. You see it comes with a pre-wired seven-pin connector that’ll make it, so all you had to do is plug it in and it’s operational. And this feature isn’t the only one that makes this tongue jack stand out; it also has a powder coated frame, which will help protect the jack against any rust or corrosion. As a result, you can expect this product to be in your life for many years. You can also expect this product to offer you a level of convenience that you might not see in other electric tongue jacks. For instance, it comes with LED lights, which will make sure using it in the dark isn’t a tough thing to do. Along the same lines, it comes with the all-too-essential manual crack override, which we’ve established is a necessity you’d love to have on any jack. I love that it comes with a 1-year warranty that’ll give you some insurance in case something goes wrong as well. Plus, this warranty conveys that the company has some faith in this jack. After all, if everyone were returning the product due to malfunction they’d lose a ton of money; therefore, a warranty like this one evokes that they have a sense of confidence regarding this product’s performance. Since it has 3,500-pound lift capacity, I’m willing to go out on limb and say their confidence is in the right place; however, there are two areas where this model fails to meet my expectations: it has a slow operation, and the instructions that come with the product aren’t reliable enough according to numerous customer reviews. Our next product is a perfect option for all you bargain buyers reading this article. You see this model from RAM isn’t only available at a low price, but it also consists of high-quality material that you’d typically see with more expensive options. In particular, the corrosion resistant zinc that makes up the footplate and inner tube is some top-notch quality material, which will ensure this jack lasts a long time. The hardened steel gears are a nice touch as well and will help keep this jack in pristine shape. I also like the 7.5-inch drop that this product comes with as it provides the user room for additional adjustment. And like the other products we’ve discussed so far, it comes with a manual crank override even though its price is much more affordable than most other options. The fact that it’s easy to use as it’s all controlled by a flip of a switch isn’t a bad feature either. I mean, overly complex products tend to ruin a lot of peoples experience with items such as this one, and it’s nice that it won’t be an issue with this RAM electric trailer jack. And of course, I’d be remiss if I didn’t mention that its lift capacity is well in range for my particular circumstances at 3,500 pounds as well. The LED lights are also a feature that I always enjoy seeing on any trailer jack I come across during my research. Its limited warranty was a bummer to see as a potential customer though. After all, you’d like to see a company express a little bit more confidence in their product than merely giving their customers an insignificant insurance policy such as the one provided here. The Husky 82022 Super Brute Electric Jack is one of the more feature excessive models on our list. 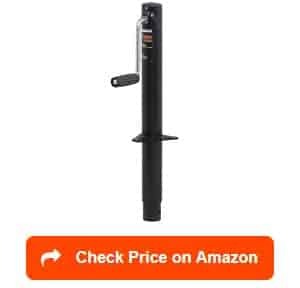 And this quality certainly isn’t a bad thing when it means you get a product that has a lift capacity of 5,000 pounds. I also love that this model’s unique ball screw design as it makes sure the jack runs at a quieter noise level than other models. This feature will ensure my use of this jack won’t cause me any headaches, which is undervalued positive with a product like this one. This ball screw design also reduces friction, motor tear, and amperage draw, which should extend the lifespan of the product itself. Plus, it can easily handle the lowering and raising of the jack as well. But the best part about this model is its use of two remotes, which makes leveling and hitching your trailer incredibly simple. These remotes allow you to extend and retract the jack without necessarily being near the product. I should also mention that the Smart Stop feature is another feature that’s available through the use of the remote. You see this function stops the jack when it becomes fully extended or retracted, which will prevent the jack from getting damaged. This model has weather-protected switches as well that’ll ensure this product holds up even in the worst conditions. And it also comes with a 2-year warranty, which showcases how much value Husky places into this product. 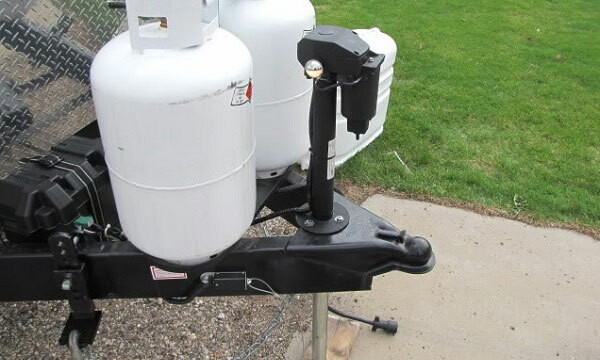 All in all, this trailer jack is a top-notch model that’ll make any RV owner’s life much easier when it comes to hitching and jacking up their trailer. But there was one thing about this product that did concern me as a potential customer. It doesn’t come with the inclusion of mounting bolts, which could make the install unnecessarily tricky. As someone that needs this mechanical stuff as simple as humanly possible, this aspect wasn’t something I enjoyed seeing. Our next product might be the best A-frame trailer jack in the entire marketplace thanks to a set of almost unrivaled features. The first thing that stands out about this Bulldog electric trailer jack is its limited 5-year warranty. You see a warranty this long is almost unheard with a trailer jack and speaks to how much faith Bulldog has in this product. I mean, there’s just too many things that could go wrong when using a jack to offer a warranty like this one unless you’re 100% sure the product can withstand almost anything. But when you have a product consisting of all corrosion resistant surfaces, it’s kind of hard to argue with the logic of their decision. I also like that this product has a bit more lift capacity than we have seen with some of the other models on this list at 4,000 pounds. A higher level of lift capacity would ensure that there definitely wouldn’t be an issue lifting my 6,000-pound trailer with a jack like this one. I should also mention that it comes with a spring loaded 8-inch drop leg, which would give you maneuverability when using this jack. 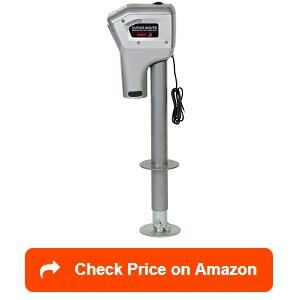 Aside from these features, this product is relatively standard with other features including 3 LED lights, a manual crank override, and an affordable price. All of these features provide a level of convenience without sacrificing anything in the performance area. Given this information, it’s tough not to see why Bulldog has such an excellent reputation for providing high-quality products that end up lasting years. But there was something within this electric trailer jack’s reviews that struck me as a little problematic: some customers reported packaging issues. In other words, the product would show up at their doorstep already damaged. Not something you’d expect from a company with a pristine reputation like Bulldog. The second product from Husky continues to confirm that this company is often ahead of the curve regarding these products. In fact, this model could be the best RV electric tongue jack we’ve gone over to this point. The weather-resistant material alone makes this trailer jack fantastic as its uniquely qualified to work in whatever condition you might encounter during your RVing trip. After all, you never know what kind of environmental factors you’ll be facing when you’re jacking up your trailer. It’s nice to know that this product won’t fold under pressure. I also like its use of a distinctive ball screw technology, which reduces the friction and will ensure this jack remains in your life for years to come. But where the product truly separates itself is with its operation time. You see this jack has a gear reduction feature, which is something I adore as it allows this model to cover 10 inches of distance in under 38 seconds. In the trailer jack community, this level of performance, and it conveys how valuable this could be for an RV owner. 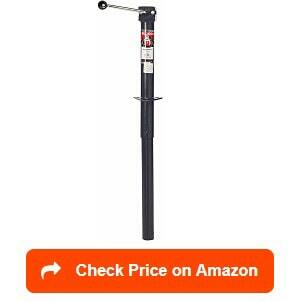 Plus, it has a 6-inch drop leg, which gives you some flexibility when you’re jacking up your trailer. As a result, this model seems to excel in three vital areas: durability, performance, and convenience. 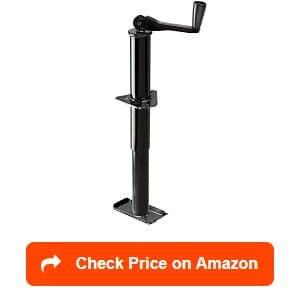 In other words, it’s quite hard for me not to put this jack into my Amazon cart right now as a potential customer. But when looking over this electric tongue jack’s reviews, there was a problem that kept popping up that struck me the wrong way. It seems this product only has a 30-day warranty, which is much too short for a product like this one in my personal opinion. The first manual tongue jack on our list is the Reese Towpower 77407 A-Frame Tongue Jack, which isn’t the most technologically advanced model; however, its capable of doing the job it’s intended to do efficiently and effectively. And for this quality, I found it deserves mention on our list. It also helps that this model is easily the least expensive option mentioned in this entire article. I mean, a high-quality product at a price like this one represent a bargain buy without question. Plus, even with it being rather inexpensive, the performance of the product itself doesn’t suffer. This model has a respectable 2,000-pound lift capacity, which would be plenty for my particular circumstances. I also like how easy this model is to install as it comes with a welded-on mounting bracket, which makes the installation process a breeze. Honestly, any feature that ensures I won’t be tearing my hair out in frustration is undoubtedly a win and something I value. It being an incredibly durable product as well doesn’t hurt either. I mean, there weren’t many customer reviews that didn’t mention how great this model tended to hold up regardless of the conditions surrounding it. It’s qualities like this one along with the low price that would have me thinking twice about choosing an electric model over this high-quality manual one. And its easy using process is another selling point that you can’t overlook. But even with the easy using process, the effort that needs to be put into jacking up a trailer using this product isn’t something I find overly attractive. I’ll gladly spend more money to avoid dealing with the extra work and effort that using a manual tongue requires. If you’re looking for a manual tongue jack, the Bulldog Fulton Sidewind Travel A-Frame Jack could be a fantastic option for you. It comes with various features that I find intriguing even as someone that doesn’t prefer these type of products. For instance, the 5,000-pound lift capacity is more than enough to handle most types of trailers without much issue or complications. In fact, it might even be a little too much for my particular circumstances, but it would lift my trailer without much effort. It helps that this model has an easy installation process as well as it has the capability of fitting the standard 2 ¼-inch mounting hole. As a result, you shouldn’t have much issue getting this jack ready for use. The fact that it offers 15 inches of vertical travel isn’t a bad feature to have either as it gives you a bit of flexibility during the jacking process. After all, a jack’s that’s too short can be quite a nuisance, but thankfully, this issue doesn’t seem to be a problem with this model. I should also mention that this model further showcases its flexibility with its side handle, which will make it incredibly easy to maneuver around any obstacles during the jacking process. Plus, all these features come at an affordable price. Overall, there isn’t much else you could think to ask for from a manual trailer jack. I mean, Bulldog even offers a limited 5-year warranty, which will give you a little insurance against something going wrong. However, there was one little aspect of this model that didn’t like, and that’s its use of plastic parts as they’re often less durable than the alternative materials. The Curt 28204 Black A-Frame Trailer Jack is our last product, and it has various features that someone in need of a manual trailer jack would find appealing. For one, it has a respectable 2,000-pound lift capacity, which should be appropriate with most trailers. It also has 14 ½ inches of vertical travel, which will give you a lot of flexibility and maneuverability in the lifting process. Along the same lines, the side handle that would also help in this regard by making it easy to avoid any potential conflicts. But the best part about this model is the easy installation process, which is aided by the all-too-important ability to fit the standard 2 1/4 -inch mounting hole. It even gives you the option of being able to be bolted or mounted on depending on your preferences. I should also mention this model is made with extremely durable materials that’ll ensure this model remains in pristine condition for years; therefore, you won’t have to pay for another trailer jack for a very long time. And since this model has such a low cost, it becomes one of the more cost-effective options in this article. As a result, it’s one of the biggest bargains on the entire market thanks to its peak durability and performance levels it offers a potential customer. But it’s still a manual trailer jack, which means it’s not the product for me. This flaw isn’t the only problem I have with this model though as several customers reported packaging issues with this product. This type of defect just kind of rubs me the wrong way because it seems rather lazy on the manufacturer part. Any buying experience will have factors that end up shaping your final decision. And in this section, we’ll go over these essential aspects to ensure you know what your expectations are for your next electric tongue jack. We also hope this section will further expand upon the idea of what a high-quality look likes that you gathered from our product review section. Understanding the lift capacity your jack needs to have is an essential part of this entire process. After all, if the product you buy doesn’t have the capability of safely operating within your circumstances, it might result in some awful consequences. The key to ensuring you know the lift capacity your jack needs is figuring out how much your trailer’s tongue weighs. The process for doing this math is rather simple as the tongue’s weight is typically equal to 10-15 percent of the trailer’s overall weight. For instance, I have a 6,000 pounds trailer, which means the jack I end up getting should have a lift capacity of at least 600-900 pounds. We recommend that you get a model with a higher lift capacity than the minimum as it’ll make sure the product itself lasts longer. As a result, I’d probably look for a model with at least a 2,000 or 3,000 lift capacity to ensure everything operates smoothly. We should also mention that electric tongue jacks are typically only meant to lift the front of the trailer. If you want one that lifts the whole trailer, you’ll need a model that distributes the weight among all the hinges. This type of jack does tend to help with overall towing experience as well. These products tend to have a lift capacity of 4,000 pounds or higher. As you might expect, durability plays a massive role in how satisfied you’ll end up being with the electric trailer jack you purchase. Honestly, who likes buying a product than having it break or malfunction only after a couple of uses? You can avoid this happening by paying attention to the material used in creating each product you’re considering. It’s imperative you look for a jack that’s either entirely welded or sealed as it’ll ensure the product don’t suffer from water damage. If water does come into contact with a jack, it can cause all sorts of electrical problems and ultimately fry the circuit. You should also look for jacks that consist of corrosion resistance material as it tends to be a significant issue with these products. In particular, the jack’s base is typically susceptible to corrosion given it’s in contact with the ground a lot of the time, which can cause the formulation of this nuisance. We should also mention that you should avoid jacks with plastic parts due to their lacking performance in the durability department. And lastly, always get a jack that comes with a warranty as it’ll give you some protection against an accident happening. 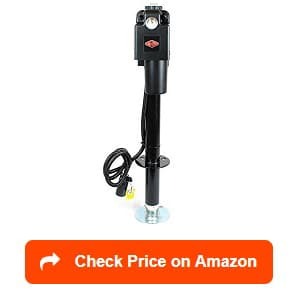 If you have any concerns about a jack’s durability, the customer reviews is another source, which should tell you a great deal about the product in this regard. Electric tongue jacks offer you two options regarding installation mechanisms: welded-on or bolted-on. If you choose a welded-on product, you should expect this to be permanent, hence, the name welded-on jacks. Meanwhile, bolted-on jacks are installed onto your trailer’s tongue through the use of U-bolts and are removable; therefore, you must decide whether or not you want something permanent or a model that gives you a little bit of a choice. When it comes to the shape of the jack itself, you also have a choice. These products come in two different configurations: straight tongue and A-frame. You can determine which one you need by your trailer’s front frame. For instance, if your trailer’s front frame is an A-shape, you’ll need an A-frame type of jack. The coupler will be mounted on the metal frame’s tip with this configuration. On the other hand, if your trailer has a straight tongue frame, you’ll need a jack that mimics it: a straight tongue jack. It sounds simple enough, but you’d be surprised how many people buy the wrong product because of this aspect. So please, ensure you’re getting the right jack shape for your situation. Otherwise, you’ll end up wasting your well-earned money on a product you can’t use. Some electric tongue jacks offer an incredibly handy feature that you might think is utterly useless at first: a manual crack. But it can quickly become extremely essential when/if your jack’s battery runs out. In other words, it’s a safety net against any electric complications that might occur with the jack. Having a back-up plan has never hurt anyone, and most of the time the models that do offer this feature don’t even cost a lot more than the ones, which don’t. As a result, it’s a good idea to heavily consider getting a jack with this feature. After all, you never want to be without the capabilities of lifting your trailer when you need it. You’ll also have a choice regarding cranking style with the options being: side wind, top wind, or some models offer both. There’s no real right option when it comes to cranking style as it mostly depends on your preference. But for me, I’d opt for a model with both, which would give the option of picking the style that works better in the moment that I need it. Like with any product, one of the most significant deciding factors will be the price. 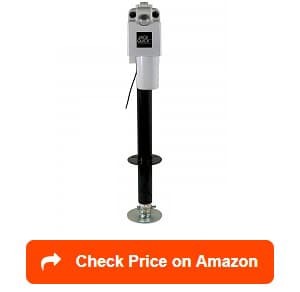 And with electric trailer jacks, the cost can vary quite a bit depending on numerous different factors. 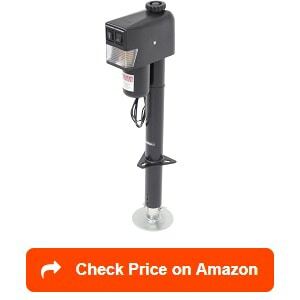 In most cases, you can expect to spend between $150 and $300 on a high-quality jack. The models that are closer to the higher end of this range typically offer useful additional features like a stand or inflatable pump. The ones closer to lower end are often consist of cheaper materials and don’t provide those useful extra features. As a result, you must weigh whether or not you value things like durability and additional features into the budget you end up creating. For me, I’m always going to go with the more expensive products as they’ll ensure I have a higher chance of not buying another trailer jack in a matter of months. The deciding factors we discussed above aren’t the only information that’ll help determine your final decision. There’s a lot of background information about these products, which you’ll need to know before making an informed choice regarding the model that suits your situation the best. And this section will cover this background information in-depth to ensure you have everything at your disposal for making a responsible decision. In the end, we want to make sure you aren’t rereading this article in a few months when it turns out you purchased a low-quality jack. What is an electric tongue jack? 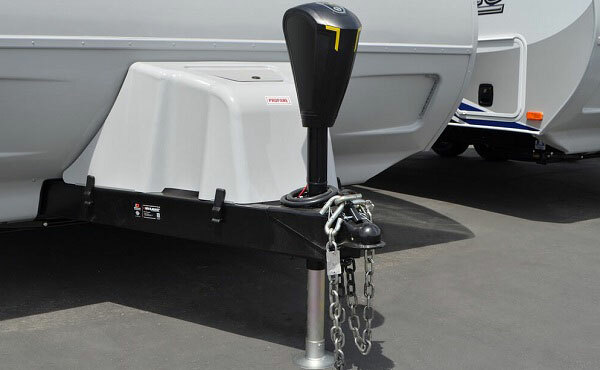 An electric tongue jack also called a trailer jack, or hitch jack ensures a trailer will rise to a required height that’s for safe connecting onto a towing vehicle. Now, you’re probably asking why a standard jack can’t get the job done with something like an RV? Well, the answer is rather simple: it can’t handle the weight of something as big as an RV, camper, or even a boat. As a result, manufacturers came up with a solution, which was these devices called the electric tongue jack. These devices can handle the more significant weight of an RV through attaching to your RV’s or trailer’s tongue. If you don’t know what the “tongue” is, it’s the long beam at the front. This beam extends and connects to your towing vehicle. After you attach the jack to the beam, it’ll push towards the ground, and it’ll have a metal base or wheel, which will support it. As you can tell, this product isn’t the most complicated item, but if you have a travel trailer, having a high-quality one becomes a massive matter of importance. I mean, safely connecting your travel trailer to your towing vehicle would be a nightmare without one. It becomes quite clear why getting the best electric jack possible is in your best interest as an RV owner. Slowly line up your tow vehicle with the now raised trailer’s tongue. Easy, enough right? Even someone like myself who’s not the best at this sort of thing finds this process to be easy. But this process might be a little different from product to product; therefore, ensure you investigate the using method of each model before you make a final decision. After all, you don’t want to buy a model that has an overly complicated using process and ends up causing you constant frustration. Trust me; if you do, you’ll be looking for a new electric tongue jack within a few months. What are the different types of electric tongue jacks? Like a lot of RV related products, there are different types of electric tongue jacks, and you’ll have to pick the kind that suits you the best. And in this section, we’ll discuss these different categories of electric tongue jacks to ensure you make the right decision. This type of trailer jack is either welded, bolted onto, or sits behind the coupler. Their lift capacity will most likely range between 2,000 and 5,000 pounds. These jacks are most commonly used for A-frame travel trailers, campers, or utility trailers. You have an option of choosing one that’s either operated manually or electric through being hooked into a 12V power supply as well. If I wanted a frame tongue jack, I’d go with an electric model: doing anything manually with these sorts of products is just an accident waiting to happen for me. We should also mention that these models come in a drop-leg style and others offer you the choice of feet or wheels. It’s something to think about before you purchase the A-frame trailer jack you ultimately decide on buying. If you’re looking for something that can handle a bit more weight, a heavy-duty jack might be the perfect type for you. These models usually have a loading capacity that ranges between 6,000 and 12,000 pounds. Sometimes you might find a heavy-duty jack that can handle even a higher lift capacity than 12,000. Of course, you should expect these models to cost a bit more money; but if you feel like you need one, these products do exist. It’s also essential that you understand these products are mounted with brackets, which offer a bit more support. And like the A-frame trailer jack, you have a choice regarding the operating process: manually or hooked up to a 12V power supply. Our last type is a side mount trailer jack, which will be either welded or bolted onto your trailer. These models feature a pivoting design, which allows for the jack to swing out for towing and down for jacking. A side mount trailer jack will also come in one of three different mounting styles: pull-pin swivel, drop-leg, or pipe mounted. The pull-in swivel version typically has a lift capacity ranging between 800 and 1500 pounds. If you’re looking for a bit more loading capacity, the pipe mounted side mount trailer jack can handle anything ranging between 2000 and 7000 pounds. And if that’s not enough, you could opt for a drop-leg model, which can handle anything from 8,000 to 12,000 pounds. Why do you need an electric tongue jack? There are numerous reasons why getting a high-quality electric tongue jack could benefit your RVing experience. And we’ll go over some of these things below to ensure you understand why getting one of these products is an essential part of being an RV owner. With an electric tongue jack, you can lift your trailer’s jack much higher than you could with a manual model. As a result, you get more flexible when you ’re hooking the trailer onto your truck or SUV. Your hitching process will become less complicated when you do it with the help of an electric trailer jack. In doing so, it saves you a lot of time by being more efficient and accurate, which limits any complications from occurring. Trying to jack up a trailer with a manual model can lead to some dangerous complications and issues. For instance, it can take a rather ugly toll on your back. And as someone that already suffers from back issues, you can bet I valve the safer operation process provided by an electric trailer jack. An electric trailer can keep a trailer level when it’s not connected to your truck or SUV in a reliable manner. Since an electric trailer jacks levels and ensures the safety of your trailer, the loading process becomes a more manageable experience. I could keep adding on reasons why getting an electric tongue jack is the right move because there are many more, but I think these five do the trick. In the end, all you need to understand is these products can make your lives much easier and safer. And with these those two benefits, it’s hard to argue against buying one. As you probably expect, this FAQs section will try to address any remaining questions or concerns you may have regarding these products. In doing so, we hope your buying experience becomes less overwhelming for you as a customer. What are good electric tongue jack brands? Every marketplace you encounter will have certain brands or manufacturers that stand out from the pack and provide customers with a positive experience. And the electric tongue jack marketplace isn’t any different. Now, all the brands we mention in our product review section are manufacturers that we consider top-tier. However, even among these select few, two companies tend to do it a little better than the rest: Husky and Bulldog. And we’ll give you a little background on both of these brands below to give you an idea of why these two companies often outpace their competitors. And honestly, all I’m looking for is a brand that can offer a high-quality product and customer service, which makes me feel incredibly confident about buying from Husky. This brand has been around for almost a century. And during this time, they’ve created an excellent relationship with their clients by providing top of line products with high-quality customer service. In particular, their electric trailer jacks are known for their “unmatched strength, reliability, safety and value.” It’s quite clear that buying from Bulldog doesn’t seem like a decision an RV owner would end up regretting. Overall, any of the nine brands mentioned in this article will provide you with a pleasant buying experience. But these two companies put a little bit of extra effort into creating their products; therefore, do yourself and give them some serious consideration when conducting your search. What size electric tongue jack do I need? 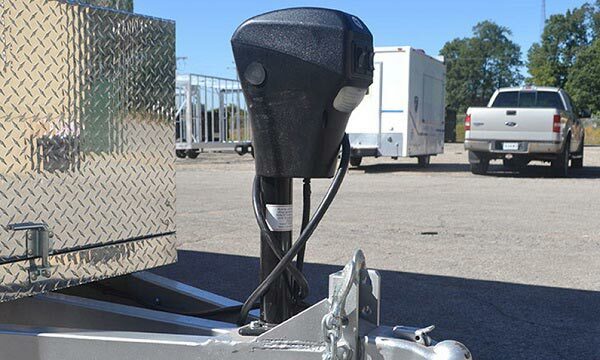 Your electric tongue jack size is determined by the weight of your trailer’s tongue weight. In other words, the jack’s lift capacity needs to handle more pounds than the weight of the trailer tongue. If you’re confused about how to know what your trailer’s tongue weighs, it’s typically 10 – 15 percent of your trailer’s overall weight. For instance, if you have a trailer that weighs 4,000 pounds, the tongue will weigh between 400 and 600 pounds. Experts often recommend getting a jack that has a loading capacity above the tongue weight as the higher weight it can handle will make the overall process easier. It’ll also ensure the jack itself lasts longer. As a result, a jack with a 1,000-2,000 lift capacity would do incredibly well with a 4,000-pound trailer. Doesn’t sound too complicated, right? Well, it’s not, but please, ensure you do have a jack that can handle the weight of your trailer’s tongue. If you don’t, this whole process can become disastrous in a matter of moments. Plus, the product descriptions will often tell you the kind of trailer that is appropriate with each jack your researching. In the end, once you establish the size you need, this whole process becomes much easier as the number of options will significantly lessen. So as you can see, determining the size is both an essential and easy part of this entire process. How do I connect my trailer to my tow vehicle? When connecting your trailer to a tow vehicle, start with safety checks first. You’ll want to ensure your truck is capable of handling the trailer’s weight. If you don’t, the consequences could end being incredibly awful. It’s also imperative that you make sure the trailer you didn’t load the trailer unevenly. In other words, all your stuff shouldn’t be pushed heavily toward one side. After ensuring everything is safe and ready for use, you then put the coupler onto the trailer’s tongue: the placement should be over the ball mount’s ball. From there, release the hand wheel. It’s also essential the coupler and the tongue match as it’ll allow the coupler’s securing device to lock into position. This device will keep the coupler attached with the ball mount. Next, it’s time to cross the safety chains below the trailer’s tongue and attach them. These chains will provide you some support in the event the trailer break away from the hitch; however, do make sure there’s some slack within in the chains to them some maneuverability. For large trailer owners, the next thing you need to do is check the braking system. You see if you have surge brakes, it’ll have a switch on your trailer’s tongue, which you’ll need to ensure is up and running. There should also be a connector that’ll you’ll use to plug your trailer into the electric system within your tow vehicle. It’ll either be a seven-way or four-way connector depending on the type of rig you intend on hitching. Once you’ve done and checked all these things, you can begin your adventure. But please, do one or two more checks to make sure everything is secure. After all, it never hurts to be a little extra cautious. How to use an electric tongue jack? The using process for an electric tongue jack tends to be rather simple. It starts with you connecting the jack’s base to an incredibly solid surface. You then hook it into a power supply, which will most likely be of the 12v variety. After plugging it into the power supply, you pull the pin on the jack’s leg, which will lower the inner leg along with the foot toward the ground. Next, you line up the outer and inner legs’ holes and put the pin back into place. Once you’ve done all these actions, it’s time you turn the jack on to extend it, which will lift your trailer’s front into a heightened position. Enter your tow vehicle and reserve it in a manner where the ball hitch directly lines up with the tongue of the trailer. 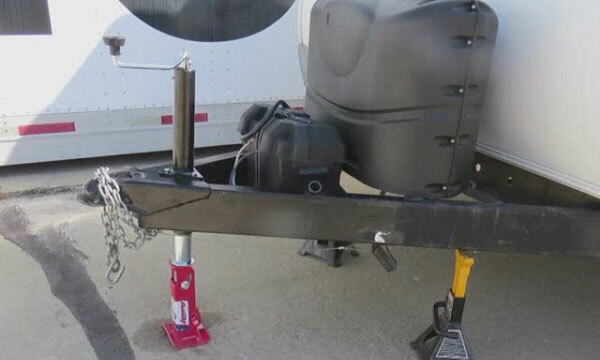 From there, it’s just a simple matter of cranking the jack until your trailer is positioned over hitch and connecting it onto your towing vehicle’s hitch. And then, you’re done and can hit the road with your trailer safely secure. How to Disconnect your trailer from your Tow vehicle? The good news is that the disconnecting process isn’t too overly complicated either. It starts by parking your tow vehicle and attached trailer on a surface, which is level. Do make sure the tow vehicle is in park, the parking brake is on, and the motor is all the way off before going any further. Once you do these actions, put blocks both in front and behind your trailer’s tires. These blocks will help ensure the trailer doesn’t start rolling away. Next, you’ll want to de-attach the safety chains and electric wires. With both the chains and wires disconnected, you should start pushing down on the coupler’s latch and at the same time turn the handwheel counterclockwise: the coupler will begin to loosen. You then should push the trailer toward your towing vehicle and use the tongue’s handle to lift the trailer. If this action doesn’t cause it to release, you should loosen the handwheel a little bit more. When the trailer is finally disconnected, make sure you set the coupler somewhere appropriate: the ground, placed on a stand, or you can even support it with the trailer’s jack. As you can see, this process isn’t something that should take a lot of effort on your part. In fact, once you do the first time, it should become almost second nature. But remember, never take it lightly as the slightest thing being done wrong could cause some nightmarish circumstances that you don’t want to experience. Trust me; a runaway trailer might sound like a funny concept, but experiencing it in person is anything other than a laughing matter. With all this new information about these products, you should a better grasp on what you’re looking for in an electric tongue jack. And this superior understand should help you shrink the overwhelming amount of options down to a more manageable number. As a result, finding the best electric tongue jack for you shouldn’t be the daunting task it was before you read this article. And once you do buy this perfect trailer jack, your RVing life will become much easier as it won’t be a hassle to lift your rig anymore. In fact, your best option might be one of the products we went over in our product review section. But regardless of the model you end up buying, we hope this article had a positive effect on your buying experience. If you have any remaining questions about these products, please feel free to ask them in the comment section below. We’d love to help make this process easier in any way we possibly can.